I have to admit that I have mixed feelings about the Christmas season. On the one hand, I love it: the lights, the traditional foods, the excited kids. Most of all, I love attending Christmas Eve services with my family, singing the old familiar Christmas hymns, seeing the sanctuary decked out in evergreen garlands, and hearing the story of the Christ child’s birth. But on the other hand, I’m with Elvis. Christmas can be blue. In fact, as I get older, I have more and more nostalgic moments for times that are past and people who aren’t with us anymore. My dad, who enjoyed Christmas like a kid, has been gone more than thirty years. Mom collected Santas and loved inviting an eclectic group of friends over for Christmas dinner; she’s been gone a few years, too. I miss the days when my daughter was young and her father and I would take her to visit his warm and jolly extended family; divorce ended that tradition, a loss for me but especially for her. I even miss my little dog, Porter, who was a feisty presence at Christmas last year but won’t be with us this year. You know how it is: you unwrap the ornaments and the memories, and they can bring both laughter and tears. And while my losses hurt, they aren’t unusual. Most of us have reason to shed a tear during the holidays. We don’t live in a Hallmark movie or a Thomas Kinkade painting, but in a real, fallen world. 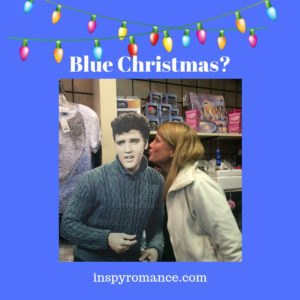 I’m with Elvis: Christmas can be blue. How fortunate we are, during sad times, to be able to turn to the comfort of scripture and to reflect on the deeper meaning of Christmas. From the second chapter of Luke: “But the angel said to them, “Do not be afraid. I bring you good news that will cause great joy for all the people. Today in the town of David a Savior has been born to you; he is the Messiah, the Lord.” And from Isaiah 9:6: “For to us a child is born, to us a son is given, and the government will be on his shoulders. And he will be called Wonderful Counselor, Mighty God, Everlasting Father, Prince of Peace.” Is there a Christian alive who doesn’t find comfort in these familiar verses? In my Christmas stories, I try to include both sides of Christmas. I often start with a character who’s a little sad during the Christmas season, because of past wounds; and I always, always end happily: with romantic love, and with spiritual renewal orchestrated by God. 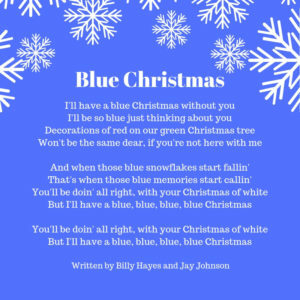 Leave a comment letting me know what you think about the idea of a blue Christmas… or about Elvis! I’ll gift two random commenters with an e-copy of one of my Christmas books, all of which include a touch of the Christmas blues before the happy ending. You can choose from any of the Christmas books you find on my website. And P.S.–Yes, that’s me smooching Elvis during a Christmastime visit to Graceland! Thank you for starting off the comments, Wemble, and with such kindness! Blessings to you during the Christmas season. Hi Lee! Thanks for sharing. As with an aspect of life, Christmas has two sides – the joyous part of seeing the splendor of the holiday through the eyes of children or the generosity of people with the “blue” / sad side of being lonely, stressed and / or family conflicts (whatever the cause). May the reason for the season, Jesus Christ filling us with HIS joy and peace. Even with loss – miss my parents (mom passed 11 years / dad passed 4 years) and the first Christmas without our 16 year old Sheltie Penny, sons all grown, and grandkids reaching the teens, HOW I approach Christmas is my choice. So I try to stay positive, not dwell on the past; but make new memories when old traditions no longer are feasible. Since the whole family is not getting together, I did the 12 days of Christmas gifts with my sons to remind them I love them and care. Best wishes. Hi Renate, you make such a wonderful point that how we approach Christmas is our own choice. And while there are sad moments, there are new traditions to be made, too. I admit I get blue around Christmas too, I miss the big family gatherings we always used to have, now it’s just me and my hubs. I hear that… do you cook a big meal for two, anyway? No, not really – too much leftovers, lol…..we treat the food as any other Sunday meal. I was thinking about your Elvis song – one song that will make me cry instantly is I’ll Be Home For Christmas, no matter who is singing it. Thanks for the monthly giveaway! Merry Christmas! Merry Christmas to you as well, Vivian! I have to remember to stay focused on celebrating our SAVIOR is coming!!! Another thing that really helps me is to be a giver, helping someone or give a gift unexpectedly. And do it as often as possible all Dec long. It makes me happy and I feel like I honor God when I give just like He did giving His Precious Son Jesus! Have a wonderful and blessed Christmas Lee! Hi Tracy! Saw that authors and stores were doing 12 days of Christmas so that gave me an idea. Our oldest son with 3 kids ages 13, 11, & 5 wanted a low key Christmas. Our youngest son, who is single lives out of town. So I wanted to set him some care packages, plus make everybody feel appreciated. On the 12th day of Christmas Saint Nicholas gave to us, a drum of popcorn, 11 stockings filled (mini stockings with a few candies one for each family member), 10 dollar gift card, a silver ornament, box of hot choclate packets, 7 days of holiday cheer, 6 car washes (families have new cars and local car wash sells coupon book with 6 car washes for price of four), 5 chocolate turtles, 4 grandchildren (gave some family craft activity), 3 sons, 2 daughters in love (took them bouquet of flowers to work) and ONE ne Christmas memory. (Asked my boys what their favorite childhood memory was.) Families are enjoying this new idea, interacting through texts and FaceTime. Merry Christmas. Thank you, Tracey… your idea of being the giver is a great way to overcome holiday blues. And look at Renate’s creative ideas! I love how helpful our readers are to each other. Renate, I love your ideas! I can’t wait to do this! I think a bit of a blue Christmas to start with that ends in a HEA is the best kind of story. I love stories that include community, because it’s the thing we most long for now. That is so true.. I think that’s exactly why we love Hallmark movies and small-town stories. My mom loves Elvis! So one of my nostalgic memories involves listening to “Blue Christmas” and my favorite “Santa Bring My Baby Back to Me” on her old Elvis Christmas record. I dubbed it onto cassette and brought it along with me when I got married. My husband hates Elvis! :D So I have to listen when he’s not around. Ha ha, Elvis is definitely not to everyone’s taste. If you love him, I can highly recommend visiting Graceland (maybe a girls’ trip though, not with your husband!). Hi Lee, I have always loved Christmas. I am blessed to still have my Mom and Dad with me. But the last few years Christmas has not been the same since I lost my Uncle. He had Down syndrome and he was the light of our family. He was always happy and he loved Christmas. He always wanted the family together. There would always be 40 or more of us gathered together for Christmas. He passed away in June 2015 at the age of 71. I miss him everyday. He could always bring a smile to my face. But I am blessed to know that I will get to see him again one day. I’m sorry for your loss, Trish. He sounds like a wonderful person. We just lost our son in October so this Christmas will be bittersweet. We are trying to remember the real reason for Christmas and that is to celebrate the birth of Christ who died to save a fallen world. We are also celebrating our son as this was one of his favorite hollidays and he loved family and all the gatherings. I’m so sorry, Pam. That must be so hard to deal with. Your faith is an inspiration. Sending hugs and prayers. Thank you so much Lee, God is what gets us through! Neutral about Elvis (sorry) and I do think Christmas can be blue for some but keeping our eyes on Jesus during Christmas helps. Hi Lee! My Christmas is always green lol I am celebrating the birth of Christ, my Savior!!! One day we’ll meet all people so dear to us because He came! Merry Christmas!